Yesterday I gave my three hour presentation “Providing for the Full Eating Season” to the Local Food Hub in Charlottesville,VA. I’d guess there were 50 people there, and 11 of them bought copies of my book! A question came up that I don’t know the answer to, and now it has me curious. Do leave a comment if you have an answer. Some professional growers need to know how to allow for the slowing rate of crop maturity going into winter, when deciding how much of a crop to grow. 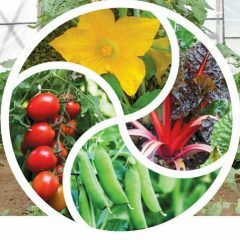 Because we at Twin Oaks don’t sell our food, we can simply provide a transition from warm (or cool) weather crops to cold weather crops, without worrying exactly on the quantity of each. Those selling at farmers’ markets or CSAs could possibly do similarly. But those selling wholesale need a certain amount of a crop – either a box or no box – but not half a box. Naturally, all growers need to look at what is worthwhile. I think in our gardens we have simply made our decisions based on experience, without a numerical base. 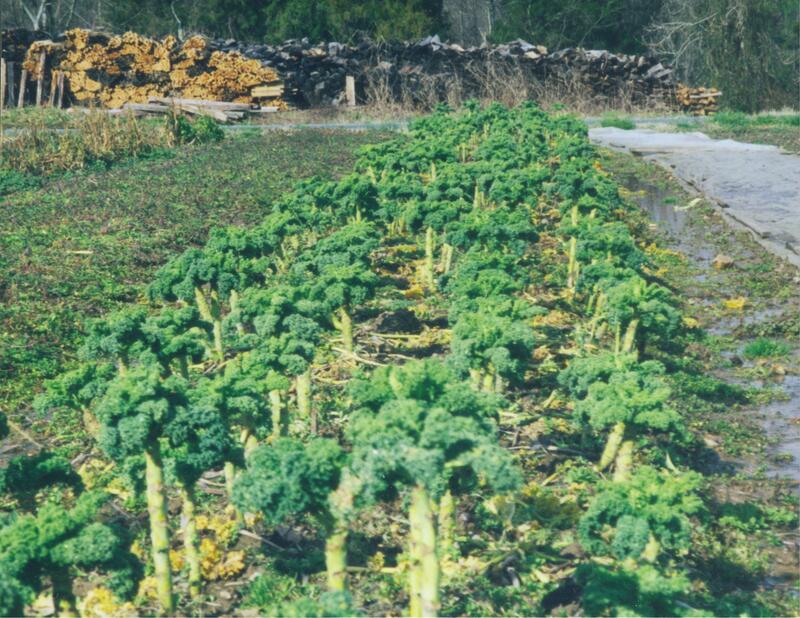 I can say that 7 x 4 x 90ft of kale will provide 10 gallons of leaves at least three times a week in November, December, February, March. Not January maybe. I’ve never actually counted. And five outdoor beds of spinach (each 4 rows X 90ft) under thick rowcover, combined with about 700 row feet in the hoophouse will be plenty for 100 people for the winter. 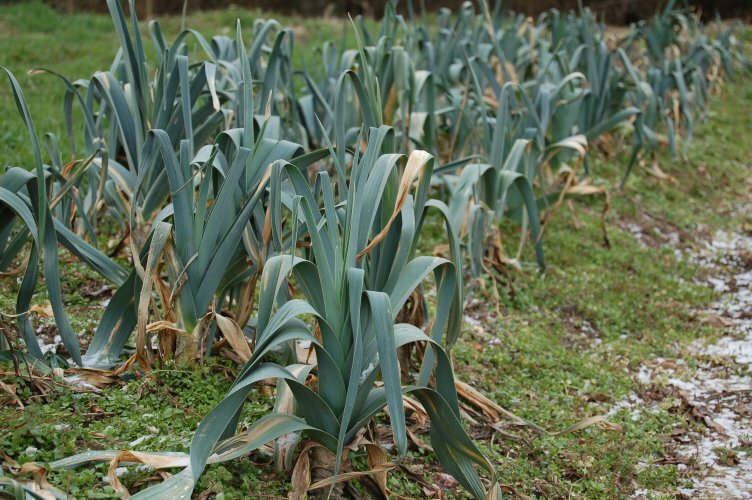 And we can eat more than 700 leeks per month from October to February. But’s that’s about all I know. Per person, that’s about 25 feet of kale, 20 feet of spinach and maybe 20 feet of leeks for winter in Virginia. In my last post I said we’d had an overnight low of 10F, but in reality it only dropped to 14F. We were lucky with the last winter storm. We didn’t get snow, only got a thinnish build up of ice from freezing rain, and din’t lose power except for 15 minutes on Monday, presumably due to our supplier switching off while reconnecting those who had lost power. Now it looks like we’re in for more cold winter-storm weather. I have in the past uploaded my slideshow presentations to SlideShare.net, but they closed down my account saying I was guilty of “violating SlideShare’s Terms of Service and/or Community Guidelines.” I can’t imagine what I can have done wrong, so I’ve appealed. The wheels of progress grind slowly. 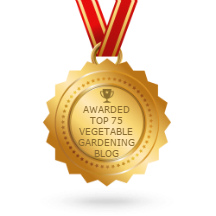 Meanwhile you can find my June 2013 presentation on Planning Fall Crops at Virginia State University; my Growing Great Garlic presentation at CFSA, uploaded by Fred Broadbent. VABF has my Crop Rotations for Vegetables and Cover Crops presentation. If anyone knows other ways I can upload slideshows, please speak up.